Digicel Business has today announced the launch of three new comprehensive service packages that are uniquely designed to help Small and Medium-sized Enterprises (SMEs) establish and grow their businesses in Papua New Guinea. 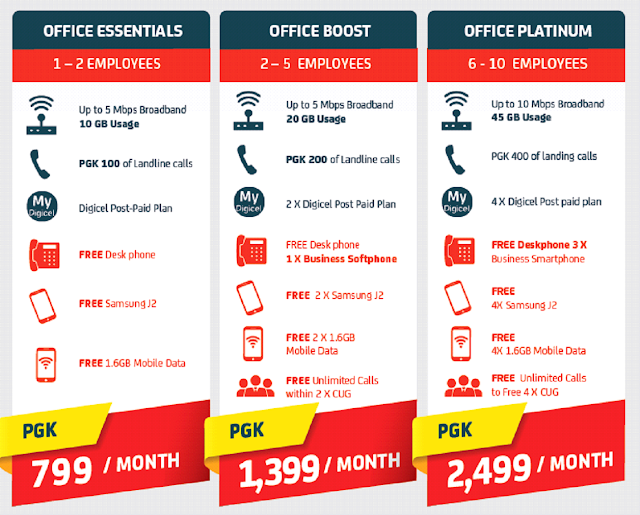 The new service has introduced a number of new packages to help business owners achieve more by using the latest technology through Office Essentials, Office Boost and Office Platinum. Each service provides an ‘office in a box’ solution with internet broadband, desk phone, smartphones, unlimited calls and data, which are designed to cater to every communication component a small business owner needs to have a fully functioning office at an affordable price. Gary Cobain, Head of Digicel Business said Digicel Business is committed to supporting the Papua New Guinean Government’s goal to grow the SME community from 49,500 to 500,000 by 2030, by making telecommunications more affordable and easier to access. “Today, Digicel Business is proud to promote entrepreneurship in PNG by offering small businesses the opportunity to have access to an international standard telecommunication infrastructure they need to thrive,” he said. “As the largest and most comprehensive telecommunications provider in Papua New Guinea, Digicel Business is excited to launch this offering to new and existing customers to help them and their business succeed long-term. Depending on which package they select, customers will have access to an internet connection of 5 Mbps to 10 Mbps download speeds and from 10GB to 45GB of data usage per month. In addition, the plans include free minutes, unlimited calls, and a free mobile internet broadband data volume of 1.6 GB with free smartphones. With these smart packages from Digicel Business, small business owners do not have to pick the services they think they may require. Each package has everything a small business needs for their connectivity solutions, such as broadband internet connectivity, desk phones, landline, and Closed Users Group (CUG) plans for up to 10 employees. They also feature 24/7 Digicel Business support, meaning that small enterprises will have access to a dedicated support team, anytime of the day by calling 126.